I’m usually not that great with memorizing recipes or making up new ones on my own but I do try my best. If I find a good recipe I’ll follow the instructions to a tee and if the family likes it, great, if not, then I likely won’t be making it again anytime soon. ..lol! The recipes that do get a thumbs up I’ll add a little star to it and then file it in in my recipe book for future reference (by the way, check back later for a future posting on how I organize my recipes). About a year ago while shopping at Trader Joe’s I picked up a bag of their 17 Bean and Barley Mix. It had a really good recipe on the back which I made for the family that night. It turned out pretty good and my kids even gave it a thumbs up. I’m sure all you mom’s out there who are always trying to come up with something yummy that the whole family will enjoy can probably understand the feeling of joy, relief and appreciation I felt at that moment. Even my pickiest eater was amazed that she liked it. 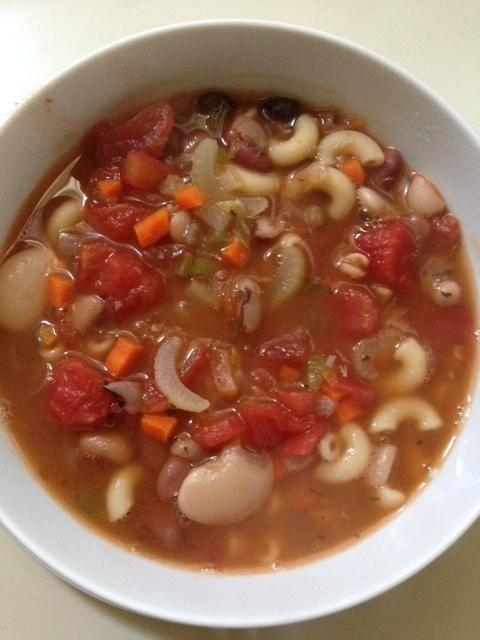 Now I thought with the cold and chilly weather we’ve been having lately that it’d be nice to make a big pot of minestrone soup using the same bean mix, but unfortunately Trader Joe’s discontinued it….booooo!!! 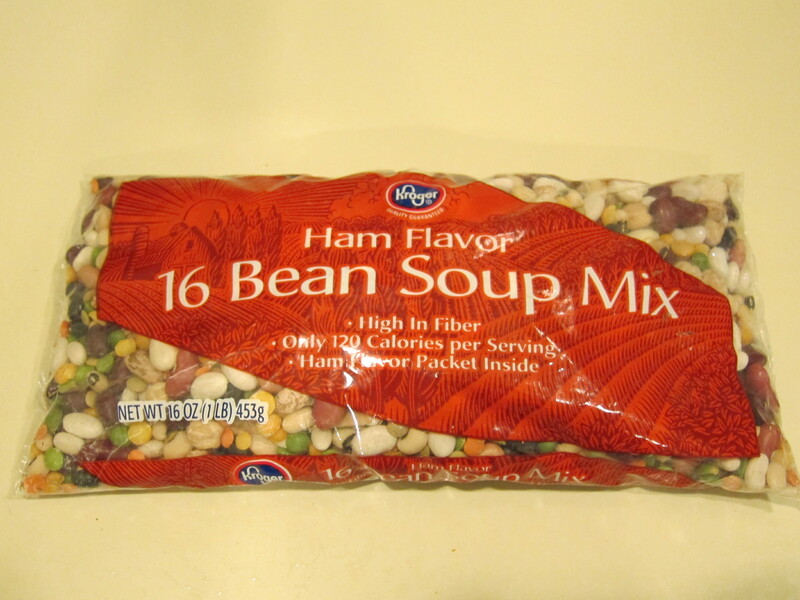 Not to worry, I went over to Food 4 Less and found a bag of their 16 Bean Soup Mix which is pretty much the same and has all the different bean varieties. But of course no recipe on the back so I had to wing it. This is the recipe I used. I don’t recall the exact measurements for some of the ingredients and I might have even left out or added an ingredient or two. Regardless, this soup was practically gone the same day I made it and the last bit of it was had for breakfast the next day by my youngest. It was THAT good! Rinse beans and let soak overnight or for about 2 or 3 hours. In a large pot add your beans and fill with water about halfway. Bring to a boil then let simmer. Meanwhile sauté carrots, celery, bell pepper, onion, and garlic in vegetable oil. (*You can add the thyme, basil, oregano, salt and pepper to the vegetables as you sauté or you can wait until you combine the mixture with the beans). Set aside. Once your beans are about cooked, add 2 cans of diced tomatoes with 2 cans of water. Stir in the sautéed mixture and pasta. Bring to a full boil then simmer for about 15 minutes. 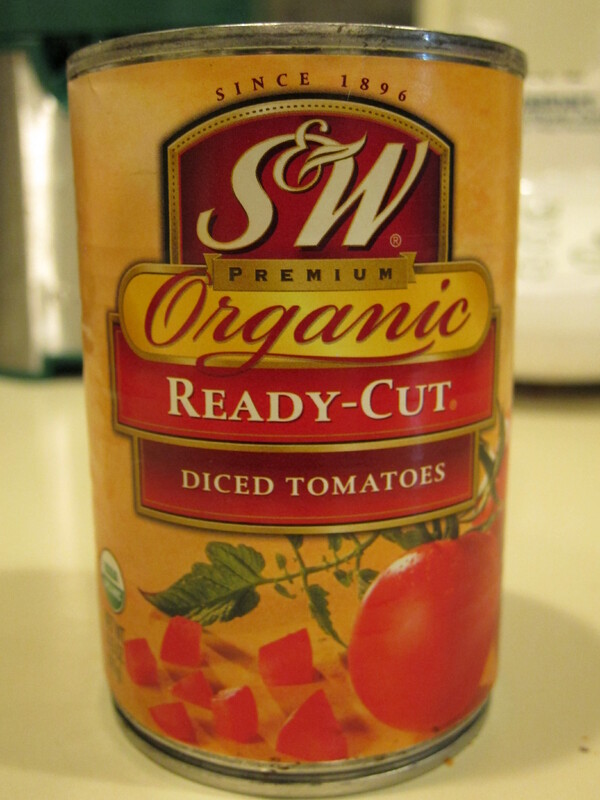 ….and in case you’re wondering, these are the diced tomatoes and beans I used. I happen to have them on hand so I thought I’d post a pic of them as well.